A massive Boston development will bring tech to the city's "last frontier" - Archpaper.com A massive Boston development will bring tech to the city's "last frontier"
Cambridge Crossing, a 45-acre development at the nexus of Cambridge, Boston, and Somerville, will provide another hub of tech and life sciences to the greater Boston area. The San Francisco-based developer, Divco West, has already begun construction on two structures within the complex as of this week, including a 430,000-square-foot office building intended to house science and tech groups. CBT Architects are the designers behind the master plan. Previously dubbed NorthPoint, the mega-development will include 4.5 million square feet of mixed-used space. 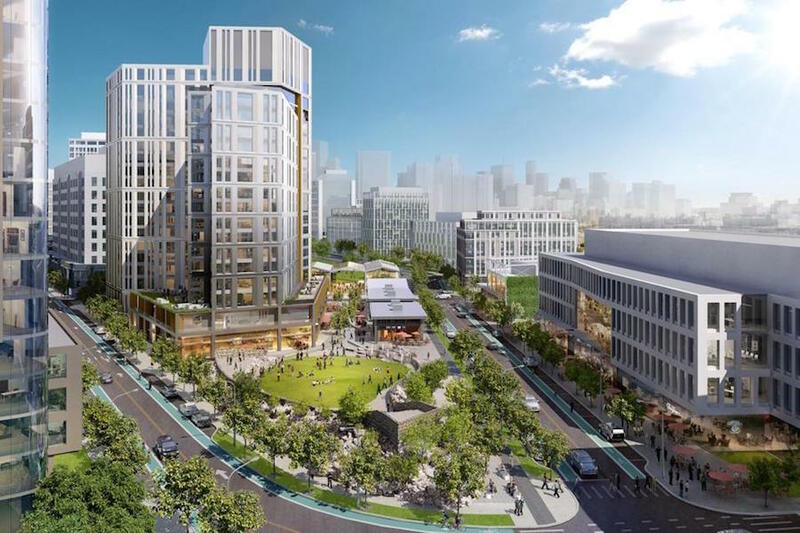 Divco West has pitched the project as a more affordable alternative to Kendall Square, a neighborhood further south in Cambridge housing large tech companies like Amazon, Google, and Facebook, alongside pharmaceutical companies and start-ups. Cambridge Crossing will include five office buildings and nearly 2,400 condos or apartments. There will also be extensive ground-level retail space including restaurants and shops. Eleven acres have been set aside for a public park at the campus’ center. “We’ve had some very good interest from prospective tenants already,” Tom Sullivan, Divco West’s president of development, told The Boston Globe. Office space within the development has been largely marketed toward tech, life science, and research groups, all thriving industries in Boston. The site could also potentially house part of Amazon’s second headquarters, but not all of it–the tech giant’s RFP requested up to eight million square feet of office space. In 2015, Divco West paid $291 million for the total acreage, which includes 17 individual parcels across what has been described as Cambridge’s “last frontier”–the city’s largest remaining infill development. The site will be even more accessible with the relocation of a Green Line light rail stop four minutes away. Plans for the development are moving through staggered permitting processes in each of the three cities involved. There is no set timeline for construction yet. Divco West expects the development to garner interest among organizations seeking cheaper spaces with more amenities in the increasingly expensive rental landscape of Boston.